Hawaii has been sending more and more men to the majors in recent years. Through the end of the 2016 season, 41 men born in the Aloha State had made it to The Show; 18 of them arrived from 2000 onward. Yet only one player out of the whole group, which dates back to 1914, has hailed from the little island of Molokai. That was middle infielder Keith Luuloa, who went 6 for 18 in a two-week cup of coffee with the Anaheim Angels in 2000. Keith H. M. Luuloa was born on December 24, 1974 in Honolulu. It’s likely that his parents, Henry and Claire, were among the many Molokai residents who choose to have their children delivered on Oahu because of the better medical facilities. Molokai, justly known as the Friendly Isle, is a quiet (not a single traffic light), relaxed home to about 8,000 people, many of whom are part native Hawaiian in ancestry. The island’s west side is arid while the eastern end boasts lush rain forests. Residents are fiercely protective of their lifestyle and have opposed commercial development. Molokai is also internationally known as the home of Saint Damien (Joseph De Veuster), the Catholic priest from Belgium who came to the island in 1873 to minister to the needs of the leprosy-stricken residents of Kalaupapa. The Luuloas lived in Kaunakakai, the island’s largest town. The baseball and softball field near downtown – all three blocks of it – is often busy. It’s a nice spot to sit and watch a game and meet the locals. The people of Molokai have been enjoying baseball for a long time. Indeed, by early in the 20th century even the Kalaupapa colony had a baseball grounds and several teams (mentioned by Jack London in his book The Cruise of the Snark). It’s also likely that the two big pineapple growers, Dole and Del Monte, helped foster the baseball culture. Dole operated plantations in Molokai from the 1920s through 1975, while Del Monte lingered on into the 1980s. Luuloa went to Molokai High School in Hoolehua. Former big-league pitcher Steve Trout coached there for a year in 2010, but from 1974 through 2000, the team was under the direction of Ken Nakayama. Nakayama – who emphasized traditional values such as being on time, working hard, and showing respect – later called Keith an inspiration to his program.ii The underdog Farmers won back-to-back state titles in 1999 and 2000. In a 2001 story, Luuloa noted that Molokai players had to travel to nearby Maui or Oahu to get exposure and competition. “It’s so expensive to fly anywhere, to other islands,” he said.iii One of those flights had a tragic ending. On October 28, 1989, Aloha IslandAir Flight 1712 went down in rain and heavy clouds, killing everyone on board instantly -- half of the people on the plane were from the Molokai boys and girls volleyball teams. Journalist Robert Collias of the Maui News said, “I will never forget watching Keith Luuloa’s eyes fill with tears as he was interviewed for ESPN’s Scholastic Sports America show on the one-year anniversary. He was a freshman who flew on the other plane home that night -- he nearly got on the plane that went down.”iv Subsequently, Molokai teams took the ferry instead. The 18-year-old went to Modesto Junior College (MJC) in California, becoming an all-state shortstop there. The California Angels, as they were then known, selected him in the 33rd round of the 1993 draft (the only other man from that round who made it to the majors was Kevin Sefcik). Keith – the first player drafted out of Molokai – did not sign until May 1994. Instead, he stayed with MJC. Junior college players have until the week before the next draft to be signed by the original team that drafted them. Then, two weeks after signing, “Keith Luuloa’s professional baseball career began with a bang -- a bad-news kind of bang. He was a passenger in a car that flipped 3 1/2 times in an accident near Sonora. ‘There are things you can’t control,’ Luuloa said. ‘That was one of them.’”vii He got into just 28 games with California’s Rookie League team in Arizona, hitting .299 with a homer and 10 RBIs. After that Keith played at home in the Hawaii Winter League (HWL), which had begun operations in 1993. He joined the Maui Stingrays, playing shortstop along with Craig Counsell. In the spring of 1995, he moved up to Lake Elsinore in the California League (high Single-A). Although he committed 38 errors at short, he had a fairly good season with the bat (.263-5-53). The Modesto Bee observed that he had “made steady progress.”viii It was enough to advance to Double-A for 1996, following his second and last season with the Stingrays. A change in position that winter was notable, from shortstop to second base. Luuloa’s progress took time, though. He spent 1996 (.260-7-44) and 1997 (.273-9-59) with Midland in the Texas League. His performance was by no means bad, but a July 1997 headline in the Honolulu Advertiser summed it up well: “Molokai’s Luuloa making strides; Angels’ prospect improves skills, waits for chance.” He played about 75% of his games at second base and 25% at short. As Luuloa’s 1999 baseball card observed, “Plays above his tools . . . Became a selective hitter and blossomed . . . Has gotten stronger . 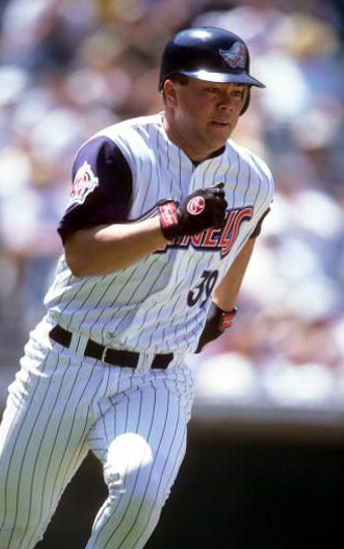 . . Can help you out defensively at almost any position.” Keith played everywhere except catcher and center field in 1998 and batted in eight different spots in the lineup. Luuloa had a good camp again in 2000 and was on watch for a call-up from Edmonton early that season. On May 16, the Angels optioned Australian infielder Trent Durrington to Edmonton and purchased Keith’s contract from the Trappers. Gary DiSarcina had a sore shoulder, and the Los Angeles papers noted that Luuloa would back up Benji Gil at shortstop. At age 25, the Hawaiian was finally in the majors. In his debut on May 17 at Anaheim, Luuloa pinch-ran for slow-footed catcher Bengie Molina in the eighth inning. He scored the tying run in a game that the Angels went on to win 8-7. Keith’s first start came four days later, and though he went 0 for 3 in that game, he connected for six singles in his remaining 15 at-bats. Three of those came at Cleveland’s Jacobs Field on May 31. Nonetheless, right after his three-hit game, the Angels returned Luuloa to Edmonton. They were clearing room for Kevin Stocker, who had signed after the Tampa Bay Devil Rays released him. Manager Mike Scioscia, breaking the tough news, told Luuloa that he’d be getting more opportunities and that he deserved to be in the majors.xiii Stocker was sidelined briefly in June, prompting talk that Keith might return for another spell, but it was not to be -- then or ever. Unfortunately, Keith appeared in just four games with Chicago’s Triple-A team, the Iowa Cubs. He suffered a fractured trapezoid bone in his left wrist -- as he slid into second base he was hit by the opposing shortstop’s throw to first. Luuloa did a nice job with the Bluefish (.313-6-51), playing mainly at third base. After the 2004 season ended, he went back to Southern California, where he had made his home after moving to the mainland in 1995. He had promised his wife, Denise Yanagisawa, that if nothing big had happened in his career by the time he was 30, that would be it for pro baseball.xxii Although he apparently did not receive any offers to get back with a big-league organization, the door was still open in Bridgeport. “I knew I wanted to go back, talked with the general manager, but I left it up in the air. I was working at Costco, was promoted to supervisor and things were headed in the right direction. I decided to move on. I just wanted to be home and be a family man.”xxiii Keith and Denise (an attorney), adopted a boy named Cheyne and later had their own son, Ashton. In the early 2000s, Keith helped a friend run a baseball camp during the offseason and volunteered as a hitting coach at Lake Elsinore High School in California.xxiv He remained involved with the game sporadically. For example, in January 2007 he joined two other Hawaiian big-leaguers, Shane Victorino and Kanekoa Texeira (then coming off his first pro season) for a clinic on their home island of Maui.xxv As of 2011, Luuloa was again living in Hawaii. He was still with Costco, working for their location in Kahului, Maui. “I’ve thought about being the first player from Molokai,” Luuloa said in 2005. “I decided to pursue the career and proved to the people of Molokai that anything is possible if you make the best of it. I played a long 10 years, had a blast, met tons of people and went to places I never even dreamed about. It is good that other people have followed me. Someone had to test the waters. Mahalo to Rob Collias, Rick Schonely, and Donna L. Ching for her input on Molokai. i Barbara Church, “Local Passion for National Pastime,” Chicago Tribune, August 9, 1996.
to Farmers,” Honolulu Star-Bulletin, May 19, 2000.
iii “Off the rock, Luuloa flies,” Portland Tribune, June 22, 2001.
iv Robert Collias, “20 years ago today, Molokai changed,” Maui News, October 28, 2009.
vii Ron Agostini, “Ex-Pirate Catches Eye of Storm,” Modesto Bee, April 15, 1995, C-1. viii Ron Agostini, “Modesto A’s Update,” Modesto Bee, August 22, 1995, C-5. ix Al Chase, “Luuloa gets ‘A’ for effort in Double-A,” Honolulu Star-Bulletin, July 29, 1998.
x Scott Bordow, “Angel all over the field,” Honolulu Star-Bulletin, April 2, 1999.
xi “Minor League Report,” Los Angeles Times, August 17, 1999.
xii David DiCenzo, “Luuloa anxiously waiting to get the call,” Honolulu Star-Bulletin. August 5, 2000.
xiii Dave Reardon, “Angels’ Luuloa back to Triple-A,” Honolulu Star-Bulletin, June 1, 2000.
xvi Al Chase, “Luuloa seeks return to majors,” Honolulu Star-Bulletin, September 15, 2001.
xviii Daniel Rodríguez S., “Al fin ganaron los Macheteros, blanqueron a Cerveza Panamá 6-0,” La Prensa (Panama), November 19, 2001.
xix Al Chase, “Local players battle in minors,” Honolulu Star-Bulletin, October 12, 2002.
xxi Al Chase, “Molokai’s Luuloa done after 10 years,” Honolulu Star-Bulletin, June 5, 2005.
xxv Robert Collias, “Valley Isle Sports / In Brief.” Maui News, December 21, 2006.
xxvi Ibid. Other draft picks from Molokai since Keith Luuloa: Nathan Starkey (1996), Michael McCutcheon (1996), Miles Luuloa (1998 and 1999), Keahi Rawlins (2002), Milton Loo (2004 and 2005).